The new musical King Kong begins performances tonight, Friday, October 5 prior to a Thursday, November 8 opening night at the Broadway Theatre (1681 Broadway). The King Kong ensemble includes Ashley Andrews (Broadway Debut), Mike Baerga (Miss Saigon), Rhaamell Burke-Missouri (Broadway Debut, Cinderella National Tour), Chloë Campbell (Tuck Everlasting), Leroy Church (Broadway Debut, The Lion King National Tour), Peter Chursin (On The Town, West Side Story), Jōvan Dansberry (Broadway Debut), Kayla Davion (Waitress), Rory Donovan (NBC’s “Jesus Christ Superstar,” Finding Neverland), Casey Garvin (Miss Saigon, Disaster! ), Christopher Hampton Grant (Broadway Debut), Jon Hoche (Broadway Debut, War HorseNational Tour), Gabriel Hyman (Broadway Debut), Harley Jay (Rent). James T. Lane (The Scottsboro Boys, A Chorus Line), Marty Lawson (How to Succeed in Business Without Really Trying; Promises, Promises), Jonathan Christopher MacMillan (War Horse), Danny Miller (Broadway Debut), Brittany Marcell Monachino (Broadway Debut), Jennifer Noble (Ghost The Musical), Kristen Faith Oei (M. Butterfly, The King and I), Eliza Ohman(Hamilton), Roberto Olvera (Broadway Debut), Jaquez André Sims (Motown The Musical), Khadija Tariyan (Broadway Debut, “The Wiz Live!,”), Jena VanElslander (Broadway Debut), Scott Austin Weber (M. Butterfly), Jacob Williams (Broadway Debut), Lauren Yalango-Grant (Broadway Debut), Warren Yang (Miss Saigon) and David Yijae (Broadway Debut). Jack Thorne (book writer) received the 2018 Tony Award and 2017 Olivier Award for Best Play for Harry Potter and the Cursed Child, and wrote the critically acclaimed Let the Right One In. Director and choreographer Drew McOnie is an Olivier Award winner for the London production of In the Heights and an Olivier Award nominee this year for Jesus Christ Superstar. McOnie directed the U.K. premiere of Baz Luhrmann’s Strictly Ballroom The Musical, and the recent London productions of The Wild Party and On the Town. Composer and music producer Marius de Vries (the films La La Land, Moulin Rouge, and Romeo + Juliet) is a four-time Grammy nominee. Eddie Perfect (songs) is a Helpmann Award winner and composer and lyricist of the Broadway-bound Beetlejuice and Shane Warne The Musical. 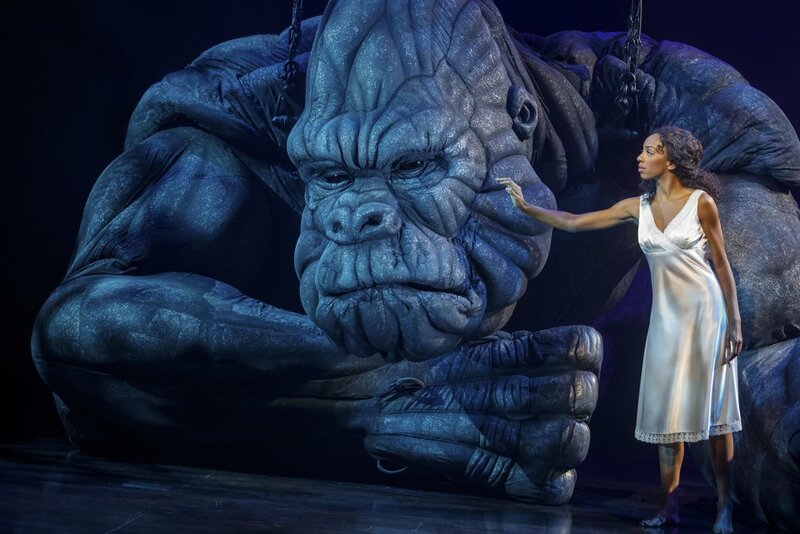 King Kong’s design team for Broadway also includes Peter England (Scenic and Projection Design), Roger Kirk (Costume Design), Peter Mumford(Lighting Design), Peter Hylenski (Sound Design), Gavin Robins (Aerial and King Kong Movement Director) and Tom Watson (Hair Design). David Caddick is Music Supervisor and Eldad Guetta is Associate Music Arranger. Tickets to King Kong are now on sale through Telecharge.com, by phone at 212-239-6200 and online at www.Telecharge.com.